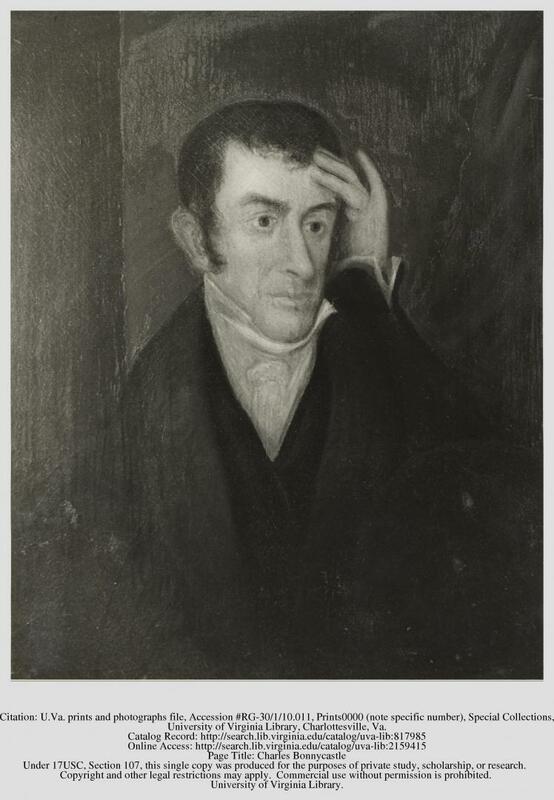 On Monday, 25th February 1839, Chairman of the Faculty Gessner Harrison received a visit from a distraught Professor Charles Bonnycastle, the lecturer in Mathematics. Bonnycastle reported that yesterday afternoon he had gotten word that one of his ‘servants,’ a man named Fielding, was being “murdered” by some students somewhere along the road to Charlottesville. Having rushed off in that direction, the Professor discovered his slave being held down by a student named Madison McAfee, whose raised club was poised to rain down what appeared to be the latest of a litany of blows upon Fielding’s bruised body. Attempting to intervene, Bonnycastle grabbed McAfee, who responded with threats, insults, and further blows to the prostrate slave. The Professor was then pulled away from the affray and held back by a second student, Franklin English, whilst McAfee continued to beat Fielding. Eventually, Mr. Bonnycastle’s protestations succeeded in stemming McAfee’s assault, and the slave Fielding was able to escape, but not before English had gotten in a few blows of his own. After Bonnycastle had concluded his account of the incident, the Chairman summoned McAfee and English to his office in order to answer the Professor’s charges. English stated that he had been on his way to Charlottesville when he had encountered a group of black men, two of whom were fighting each other while the rest gathered around to watch and cheer them on. Having taken it upon himself to break up the fracas, English reported that he had been subjected to verbal abuse by one of the men, the slave Fielding, who objected to being manhandled by the student. English responded by striking the man several times with a stick, but finding himself unable to manage Fielding’s violent resistance, and seeing McAfee nearby, he called upon his friend to help him. The pair then set about punishing Fielding for his insolence, but it was not long before Bonnycastle arrived to rescue his slave. Over the next few days, Chairman Harrison went about collecting statements from several witnesses to the incident, hoping to gain some clarity as to where blame should be apportioned in the affair. These were then laid before the Faculty at a meeting of March 2nd. Several testified that Fielding had indeed been insolent and disrespectful to the students, which in turn had provoked them to punish him with a beating. It was also shown McAfee and English had jostled the Professor after the latter’s intervention, and that McAfee had directed inappropriate language towards Bonnycastle. After due consideration of the facts of the case, the Faculty came to a unanimous decision. The students, McAfee and English, would not be subjected to disciplinary action, the Faculty being of the opinion that the “peculiar circumstances” of the incident excused their disrespect to Mr. Bonnycastle, while the vicious beating that they had dealt to the slave Fielding, it seems, was justified due to the black man’s insolence. For Fielding, however, it appears that the beating he had received may not have been punishment enough for his impertinent behavior, as the Faculty indicated that they would leave it up to the local law court to determine if further approbation against the slave would be necessary. University of Virginia. Journals of the Chairman of the Faculty. Vol. 6 (25 February 1839): n.p. University of Virginia. Faculty Minutes. Vols. 4 and 5, Part 5 (2 March 1839): pp. 623-30. Winters, Thomas M. "Professor Bonnycastle's Slave is Beaten By Students (1839)." JUEL, September 24, 2015. http://juel.iath.virginia.edu/node/320.